A couple years before this moment, Amber and Michael Darst were expecting their third child, a girl they planned on naming Megan. Although the pregnancy was healthy, there were complications towards the end which led to a C-section. In the delivery room when there should have been sounds of newborn cries and congratulatory slaps on the back, a strange silence fell over the medical staff instead. They delicately informed the couple they in fact had a baby boy, and he had some serious issues. But no one could tell them what they were. While the doctors tested their newborn son, the couple came up with a name: Colton Andrew. Then, there was nothing to do but wait. 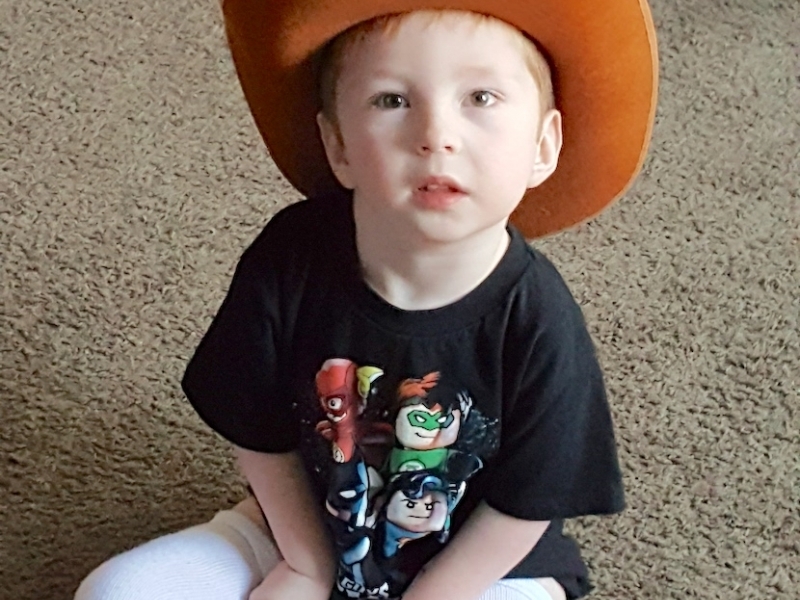 12 grueling hours later a doctor came to inform the parents they had diagnosed their son with Arthrogryposis Multiplex Congenita, or AMC. This disorder is characterized by congenital joint contractions that cause muscle shortening and result in physical deformities. 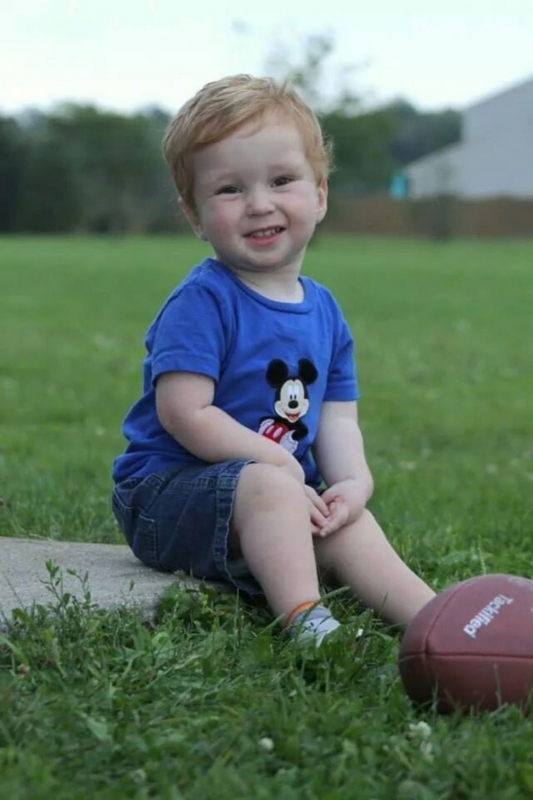 What doctors found was that Colton had very typical symptoms of AMC in his legs. When he was born they were twisted and constricted like pretzels. Already in his short life he has had several surgeries on them, including three operations on his ankles and feet, a double hip surgery, and the removal of 1/2 inch from one of his femurs. We just found out that Colton will need this surgery, the removal of part of his femur bone, every year until he stops growing. 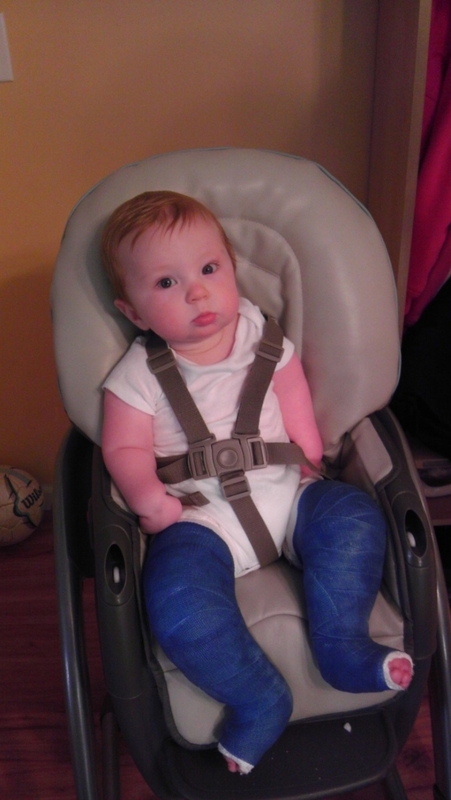 Following each operation he has to wear a full-body cast for 6 weeks. On the horizon there are several more surgeries to his legs, with the hope that some day he might walk. That part is up to Colton. His arms, however, are a different situation. Colton’s case is more rare because for him, AMC affects all four of his limbs instead of just two. 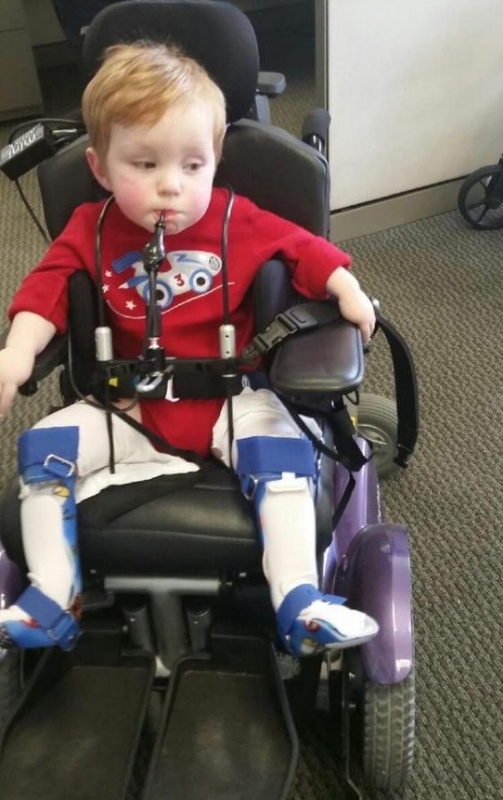 After nerve and genetic testing, doctors cannot determine why Colton can’t use his arms. They agree he will never be able to, which presents unforeseen difficulties for him. He is unable to do most things for himself and requires constant attention. Although what his future will look like still remains unclear, the family is more than happy to focus on the present. They have a talkative, smart, smiling little boy who loves for people to hold his hands and “help” him play. He loves to be active and swing or scoot around. Every day they watch in fascination as he learns and makes tremendous strides. Then, in October of 2013, Michael Darst made a choice that would change his son’s life. In an effort to raise money for Colton’s medical expenses, Michael reached out to the notoriously charitable Chive Indy chapter. Once they heard about Colton’s journey, they jumped on board. 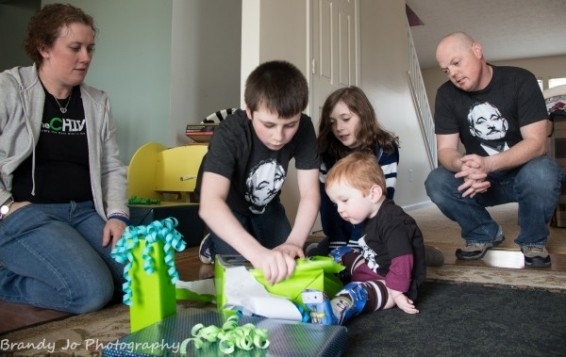 The Chivers planned a mini meet-up that raised a not-so-mini $2,000. Since then, they’ve kept up with the Darst family and celebrated Colton’s milestones. But these do-gooders had a feeling there was more that could be done, so they reached out to Chive Charities. At the time, the family car was a 2000 Saturn that could barely fit the kids and Colton’s necessary equipment. Every trip as a family of 5 meant concessions had to be made; important items had to be left behind. 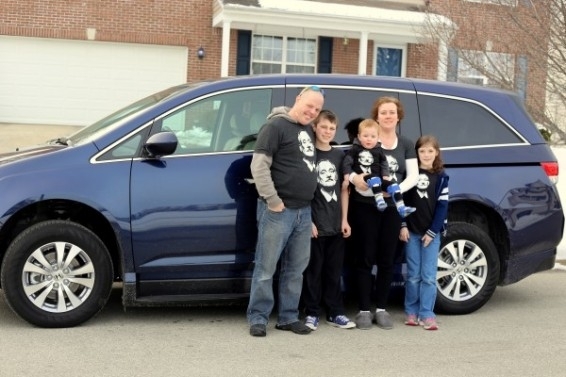 Chive Charities supplied a $59,000 grant for a 2014 Honda Odyssey EX with an ADA ramp. Now the family is able to travel safely together to cheer Colton through his future surgeries in Philadelphia. After all of Colton’s presents were opened and the living room looked like the aftermath of a wrapping paper tornado, he couldn’t wait to test them out. On the driveway he whizzed around on his little car, giggling and smiling from ear-to-ear. Around him, his family (and the larger family that is made up of local Chivers) smiled too as they watched. They couldn’t help it, his joy was infectious. When he tired himself out, Michael put Colton back in his wheelchair and wheeled him back to their house. At the entrance to their front door it took a couple people to lift Colton’s wheelchair and carry him up the few steps onto the porch. Every time they leave the house with Colton this is the routine: carrying him up and down the stairs in his stroller or wheelchair. This is a constant inconvenience now, but it will become a real problem as Colton continues to grow. 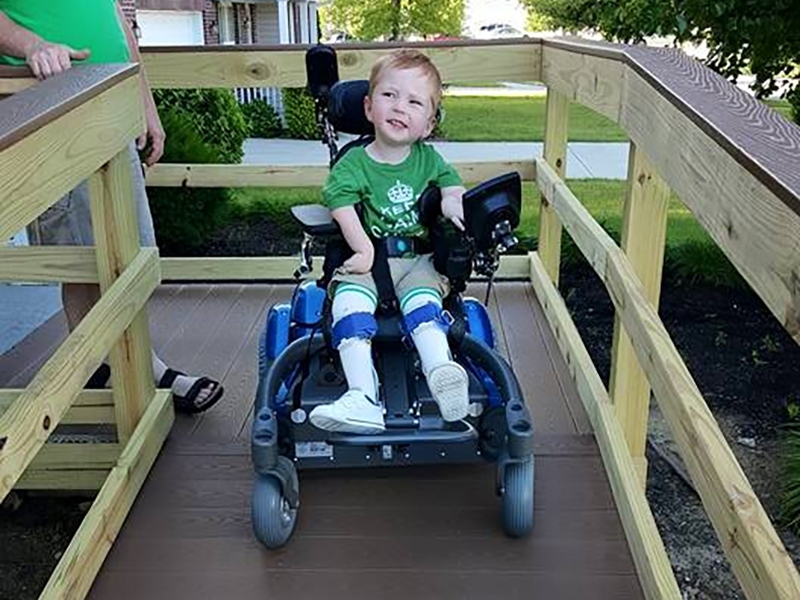 So, the Darsts need a wheelchair ramp for their house, and we need your help to make that possible. Enter Chive Nation. We know what you’re capable of, so we’re setting the bar at $10,000. Born September 20, 2012. 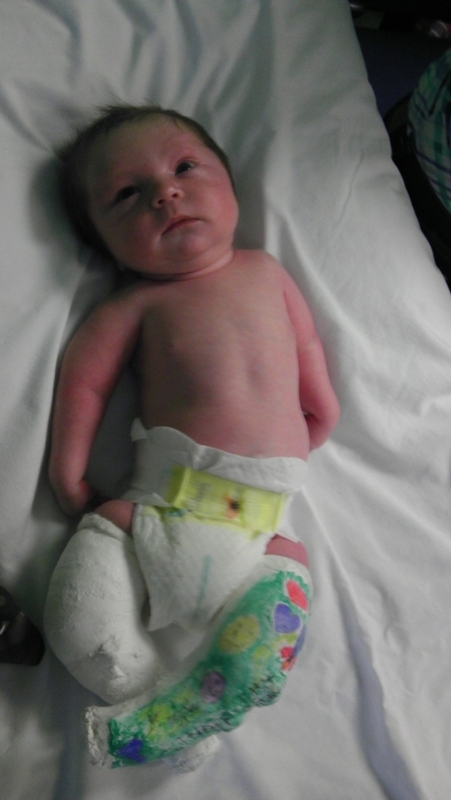 Only a few days later Colton endured his first surgery on his legs. Colton’s siblings have an “uncanny ability” to cheer him up if he’s ever down. 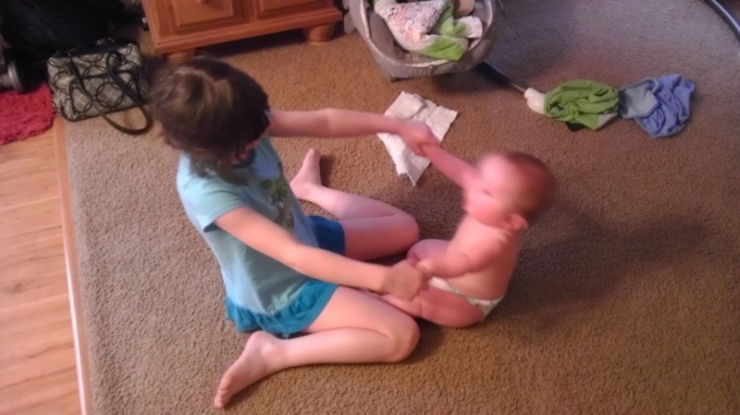 Here big sister Kayla dances with him. Michael tells us that Colton’s personality is a mixture of his older two siblings. He gets his goofy side from Peyton, and his flare for drama from Kayla. This goofy expression has Peyton written all over it! 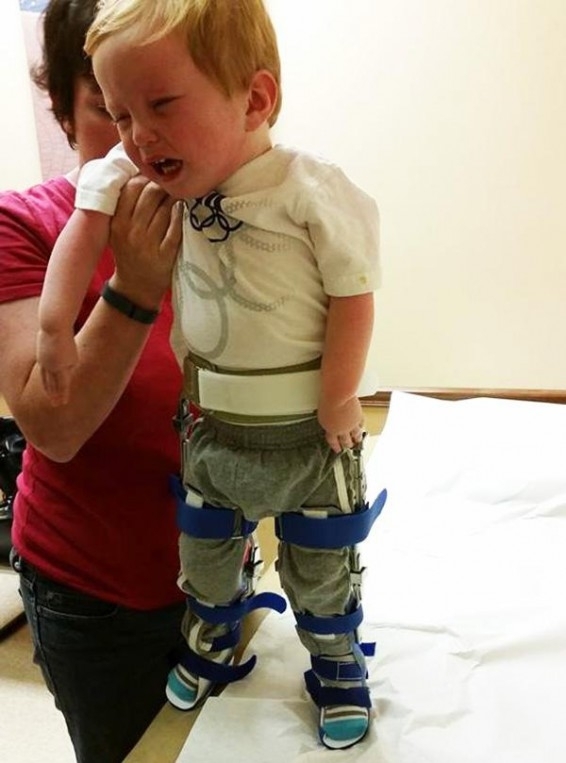 Here Colton gets fitted for his leg braces, which is exactly as painful as it looks. At 8 months old the backs of his ankles were cut to properly align his feet. Colton works with a physical therapist and is making strides but it is a long, difficult process. 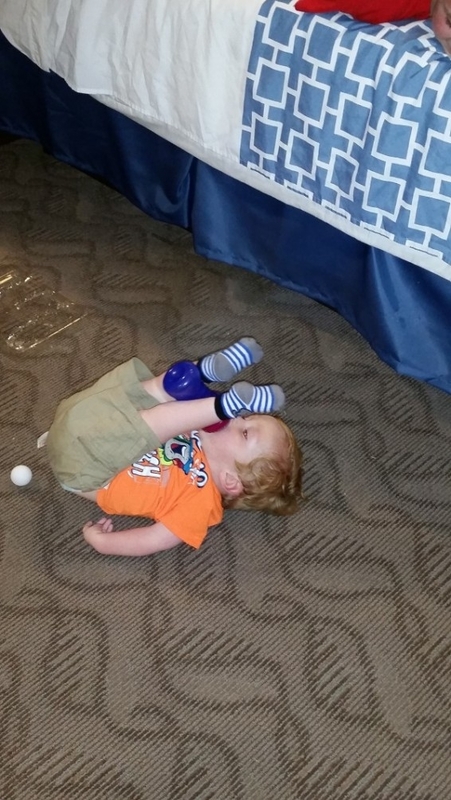 Although Colton can’t use his arms, he’s adapting to doing things for himself with the limited use of his legs. There are certain things Colton can’t adapt to, however- he’ll never be able to throw a football around with his dad and brother. Realizations like this make the family treasure what they have. 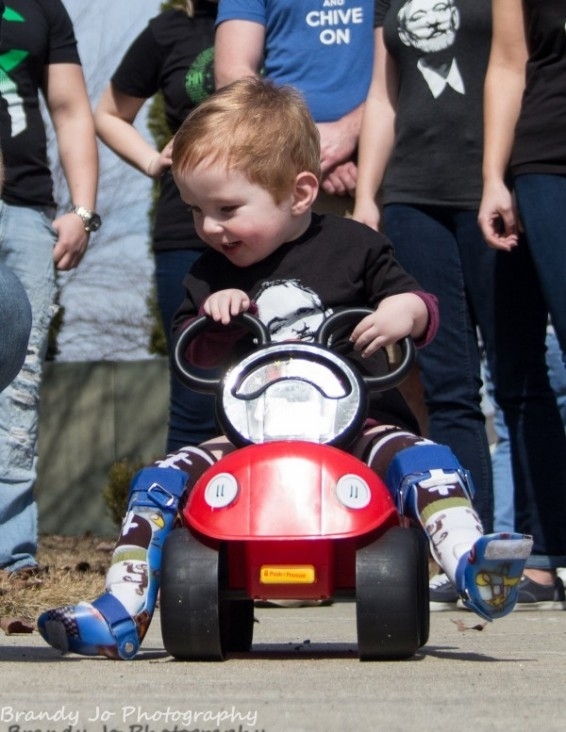 John had spoken to the Chive Indy admins and heard that there were some physical therapy toys Colton would greatly benefit from. So he hung up the phone, bought the items, and had them delivered to the Darsts on behalf of theCHIVE. 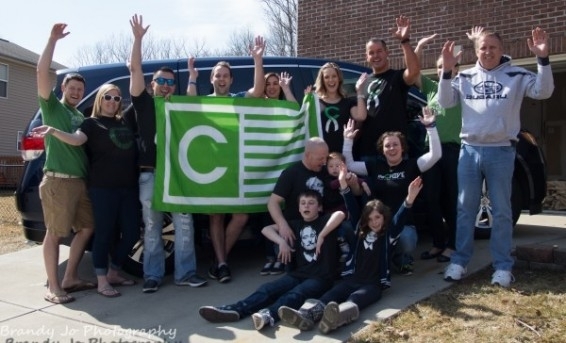 The members from Chive Indy drove out to the Darst’s house together to surprise him. The day before the party the family’s refrigerator broke down, and they were hastily trying to salvage groceries while ordering a new one. Managing this task with three children was stressful, to put it mildly. Luckily, a Chiver lived in the area and one phone call later he was replacing the fridge and getting the pipes and electrical sorted out. That’s what this community is about: lessening each other’s burden. Here’s Colton’s new power wheelchair! He controls his directions not with his hands, but with his mouth. This will make a huge difference for his sense of independence. The Darsts posing in front of their new van! This is Michael and Amber’s daily routine. Even more difficult is when they have to do this alone. 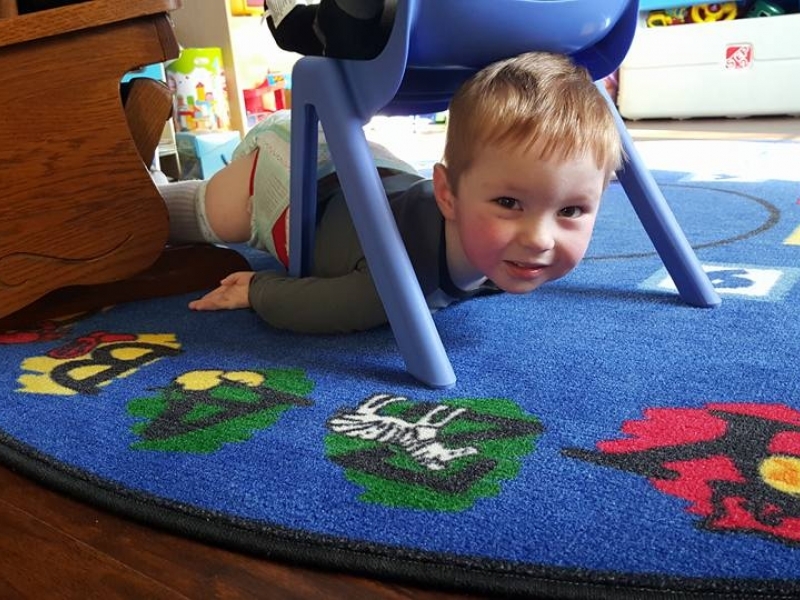 As Colton grows, this problem has the potential to limit his mobility and therefore, his experiences. We’re not going to let that happen. 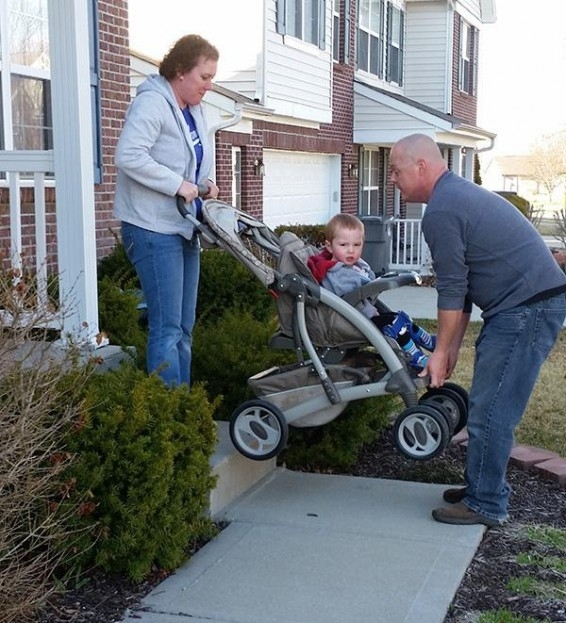 To accommodate Colton’s power wheelchair, the Darsts will also have to widen the porch when they add the ramp. For Colton to be able to freely enter and leave his own home is not a luxury- it’s essential. What it means to be a Chiver isn’t limited to meet-ups and good times, it’s about forming a family with people you’re not related to. It’s about dropping everything to help someone that needs a hand. It’s about making the world 10% happier. Chive Indy and Chive Charities have rallied together to contribute $61,000 so far. Now it’s up to you, our Chive community, to bring it home. 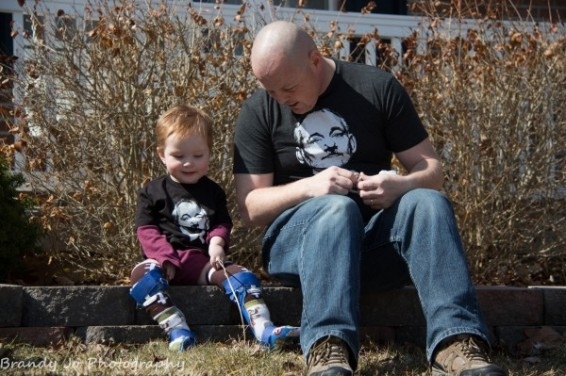 It is because of your donations that Chive Charities is able to continue changing lives. To actively participate in building a better future, you can donate HERE.